The seller of today’s Nice Price or Crack Pipe Boxster claims it to be “HISTORIC!!! !” by virtue of its age indemnifying it from the Maryland State inspection. That likely sounds bogus to you, but its price might turn you into a believer. At the time it was built, yesterday’s 1984 Mustang SVO was considered by Ford to be the company’s M3—a solid performer intended to take the Mustang in a whole new direction. Of course, back in those days BMW didn’t have the option of V8 power for their 3-series on steroids. Ford had that option, which meant that much of what the SVO offered could be had much cheaper and with more potential. Still, the SVO is a special car—hell, it has racing stripes on its intercooler for crying out loud! That fact and its exceptionally nice shape seemingly made yesterday’s edition a deal at its $12,500 asking, as it took home a solid 60 percent Nice Price win. That Foxstang we looked at yesterday was admittedly an old car. It was probably built before many of you were born and lacked a lot of safety and convenience features—things like airbags, onboard computers and the like—that we pretty much take for granted today. There’s another car that’s been part of the automotive landscape for quite a while, but is perhaps such a stalwart icon of the era that you might not even realize its age. That car is Porsche’s mid-engine for the masses, the Boxster, and this 1998 example is presently old enough to buy booze and roll the bones in Vegas. Perhaps more astonishingly, the Boxster was introduced two years earlier, in 1996 making it almost old enough to rent itself in many states. Holy cow, the Boxster has been around for that long? How’d that happen? I guess a big factor in the little Porsche’s longevity lies in the fact that they got so much right on the car right out of the gate. The entire front half of the car was designed to be shared with the 996-model 911 and, depending on your opinion, either elevated the Boxster or diminished that series of 911. Regardless, we’re now on the fourth generation of Porsche’s entry-level offering and that means the used car market is pretty rife with the rides. The result is a wide spectrum of cars from which to choose, so you’d really want to pick the best one you can at the lowest price you can finagle. This one, in Arctic Silver Metallic over a gray leather interior looks to be a pretty well maintained example, so let’s look at the details and then at the price. The seller says that the car comes with a reasonable 118,000 miles on the clock and a clear title in hand. Being an early edition of the 986 (Porsche code for first Boxster model) this car comes with a 2480-cc version of the M96 flat six giving 200 horsepower. That’s the engine that had issues with sliding cylinder liners and of course the infamous IMS bearing. Here the engine is complimented by a five-speed transaxle. All of that is said to “run great,” with the engine giving the greatest kicks between 4- and 6-thousand RPM according to the ad. The seller also notes that the oil was recent changed and instead of magic crystals like I use, he ran the draining oil over a magnet to see if any ferrous metals were ferried out along the way. The test results apparently came back negative. Other recent work on the car includes a replacement of the windscreen and new rear tires. Both the top and the seats were recovered prior to the present owner taking possession. The bodywork looks to be in serviceable shape, albeit with a sizable ding marring the boot lid. The fried egg headlamps also show a bit clouding but they’re far from gone. The factory alloys have wear on the spokes too, but hell, whoever looks down there? The interior presents better in the pics, those recovered seats really sprucing the place up well. There is some wear on the hand brake, shift knob, and steering wheel but that’s to be expected on a car of this age that gets some use. Other issues include an A/C system that could “use a charge” and a starter that’s a bit recalcitrant when the car is not used for a bit. You might want to budget in a replacement starter in your purchase planning. 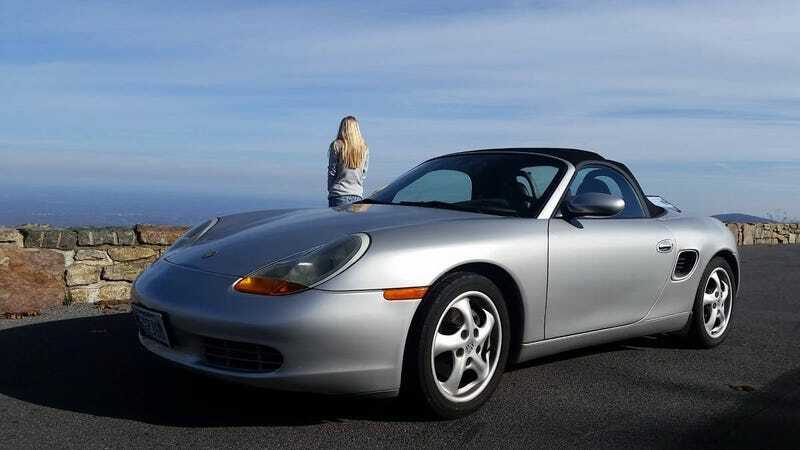 One important thing you’ll want to consider if you’re considering buying this Boxster is its $5,800 asking price. We should in fact, do just that. What do you think, is this of-age Boxtser seemingly worth that much as it’s presented? Or, does this old car have too much history to ask so high a price? H/T to Keith Jackson for the hookup!